As most aficionados of the history of Chester-le-Street are keen to relate, this famous old town in the heart of County Durham was the original long-term resting place on the English mainland of the mortal remains of the great St.Cuthbert … before they were whisked off to first Ripon, then eventually Durham for permanent burial. The famous saint lay in stately repose at Chester-le-Street for some 112 years during 883-995AD. When they arrived, however, the travelling monks didn’t expect to stay long. They’d been on the run for seven years with Cuthbert’s coffin and treasures and fully expected to move on again soon enough. So though there was plenty of stone lying around from the days of the Romans, they decided to throw up a temporary wooden church and dedicated it to St.Mary & St.Cuthbert. By and by, they decided to stay put for a few generations – so they turned their thoughts to other religious matters. 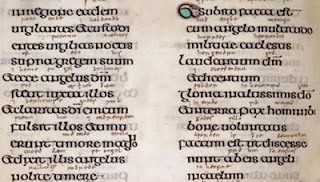 Not least was the first ever translation of the (Lindisfarne) Gospels into what we may consider to be a form of English – a task completed between 947 and 968 by ‘Aldred the Scribe’ by way of the scribbling of notations in Old English alongside the original Latin text. So quite a coup for Chester-le-Street: the site of the first English translation of the Gospels – or at least the earliest surviving copy. So next time you see a copy of the famous Lindisfarne Gospels look out for Aldred’s writing between the lines! In case you’re wondering, a short while after the removal of Cuthbert’s remains in 995AD a permanent, stone church was built on the site of the wooden affair around 1056 – bits of which can still be found in the fabric of the present-day parish church. Lumley Castle, near Chester-le-Street, has put the willies up many an unsuspecting visitor over the years thanks to rumours of ghostly goings-on in its ancient corridors. The most famous is that of Lily of Lumley, the wife of the castle’s founder Sir Ralph Lumley. After a few years frantic activity in the name of his country, Sir Ralph returned from a spell in prison in Scotland to his manor house near Chester-le-Street in 1389 and obtained permission to convert the said building into a castle. This he did, though, as chance would have it, he fell out of royal favour and ended up losing his head in 1400. During one of his absences from his new abode, two Catholic priests are said to have confronted his wife, Lily, to question her about her failure to embrace ‘the Faith’. When she again refused to comply, it is said that the two clerics grabbed her and threw her down the castle well to her death – presumably in an attempt to save her soul. Realising the trouble that they were now in, they hatched a cunning plan to extricate themselves from the unlikely predicament. They made haste to a nearby village, ‘borrowed’ a sick young woman and took her to a local nunnery. As expected, she soon died and the priests managed to persuade Sir Ralph that the woman was his wife, and that whilst he’d been away she’d decided to become a nun. Gullible Sir Ralph appears to have swallowed the story and that seems to have been the end of it. But, of course, the ghost of Lily lives on, and has, from time to time, been known to drift up from the depths of the well and wander the corridors of the castle. Lumley Castle is now a hotel and many guests have reportedly been spooked by Lily’s wanderings – including the many famous cricketers who frequent the establishment when playing at the nearby Riverside Ground. Pi, the ratio of a circle’s circumference to its diameter, is perhaps the most famous of our mathematical constants. It has fascinated many of the brightest sparks in the history of mankind, often dominating the thoughts of far too many for far too long. It even has a film of its own. Just as strangely fascinating as pi itself are the odd-ball folk who have, over the years, dedicated large chunks their lives to its calculation. Yes, mathematicians are strange creatures, and the extraordinary William Shanks was no exception. In the long chronology of the computation of pi, that of Mr Shanks’ is right up there with the best of them. And he was a North-East boy: born in Corsenside, Northumberland, but who lived out the final several decades of his life in Houghton-le-Spring. He settled there in 1847 after marrying his wife, Jane, in London the previous year. He owned and ran (and lived in) a private boarding school in Nesham Place, an activity which afforded him plenty of time to indulge his passion for sums and such like. He was soon publishing works on mathematics, and began working on the expansion of pi at an early stage. Beginning in the early 1850s, he pushed the computation of the famous constant out beyond 500 decimal places – then 600, then finally (in 1873, after a bit of a rest) claimed a whopping 707. During his ‘gap years’ of 1850s-early 1870s he worked on many other mathematical problems, including the calculation of e and Euler’s Constant y to more decimal places than ever before. He also published a table of prime numbers up to 60,000, found the natural logarithms of 2, 3, 5 and 10 to 137 places, and a whole host of other bits and bobs. Shanks’ work on pi remained unchallenged (and unbettered) until 1946, when his landmark 707 decimal places was found to contain an error at the 528th place when a certain D.F.Ferguson tapped the problem into his desk calculator. Shanks’, on the other hand, had no such luxury of course. He would work for hours, manually, on his little problems most mornings, then check for errors in the afternoons – taking him a good twenty years get as far as we can get in a split second today. William Shanks died, aged 70, in 1882, and was buried in nearby Houghton Hillside Cemetery. Until twenty years or so ago there stood in the corner of the garden of the Rectory at Houghton-le-Spring an ancient, natural relic known as the Gilpin Thorn. It was an ugly, gnarled affair – a hawthorn tree most probably – which was said to have been planted by Bernard Gilpin, the great ‘Apostle of the North’. Gilpin was the local rector at St.Michael and All Angels Church during 1558-1583, and was much famed for his piety and benevolence. The tree is said to have sprung from a cutting taken from the famous Glastonbury Thorn. This local landmark was, until the mid-20th century at least, maintained with some care – or so it seems. Reports from Victorian times have the tree being braced with collars, then when, under its own weight, it split in two, its tired limbs were propped up by timber supports. Pictures from the 1950s show the tree struggling manfully on, but by the 1980s it appears to have entered a phase of terminal decline. Local vandals helped it on its way to an undignified death and removal around 1990. But the story does not end there. A local man, Peter Tate, had had the foresight to take seeds from the old tree before it expired, and saw to it that two new seedlings were born. One of these was planted in the grounds of the Rectory … though it appears that both specimens have now disappeared, whereabouts unknown. What a strange old story. Note: Almost all of the information upon which this article is based was taken from the Houghton-le-Spring Heritage Society website – an excellent little article, within which you will also find some nice pictures. It’d be great if anyone could shed further light on the mystery of the missing saplings – do comment below if you can help. Bernard Gilpin is one of the true icons of the history of the North-East of England. He was born in Kentmere in what we now call the Lake District, but earned his fame as Rector of Houghton-le-Spring during 1558-1583. 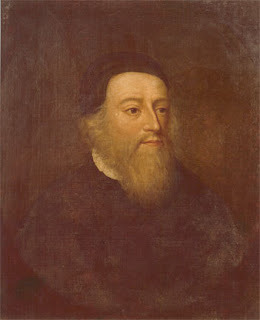 Gilpin was born into a well-to-do family in 1517 and attended Oxford University where he became a student of religious doctrine. Prior to his appointment at Houghton-le-Spring he moved through various posts and places during what was, of course, a period of turbulent religious and political manoeuvrings (the 1540s and 1550s). He even spent a spell on the continent during the reign of Queen Mary. On his return to England, he was invested with the archdeaconry of Durham by his mother’s uncle, the Bishop of Durham (in 1556). Gilpin, though, had a history of attacking clerical vices – a stance which brought him many enemies. Twice at around this time he was openly attacked by his peers, but defended by the Bishop. It was then that he was handed the attractive post at Houghton-le-Spring. Attacked again thereafter he was summoned to London, but was saved possible martyrdom by breaking his leg en route and the convenient death of Queen Mary. So off he toddled back to the North-East. During his long tenure as Rector at Houghton-le-Spring he gained a reputation for great benevolence. The richness of his office enabled him to entertain the great and the good – as well as the poor. Every Sunday from Michaelmas to Easter he kept open house, providing dinner for all who came. He also aided in the education of the local children, including the building of a grammar school in the town. Gilpin, though, gained his reputation proper by travelling widely across the region, from Northumberland to Yorkshire and from Cumberland to Teesdale, where he spread the word of God and became the so-called ‘Apostle of the North’. He was offered other posts, including the See of Carlisle, but preferred to carry on the work he had started from his base in Houghton-le-Spring. In 1583, aged 66, and much weakened by a recent accident with an ox in Durham Market, Bernard Gilpin died, and was laid to rest in his church. His tomb still adorns the interior.